It is a sad thing that nowadays in the bookstores you find every week myriads of new books in huge piles, while it has become impossible to find a book which was published just one year ago. Also among the publishers, the new has taken the place of the meaningful, and who cares about the readers, this is the trend and let’s follow it, whatever. Too bad that this illness has spread also to our cozy niche, the books of Italian language for foreigners; once upon a time the shelter of the “Italian for foreigners” books was almost forgotten, stocked with always the same books – boring but reassuringly. When you needed a copy of some classic, you just went to the bookstore and bought it. Now even in this field there are new books every month, the new book push away the old, and the classic which you have been finding for more then 10 years suddenly has disappeared. Among the best in my personal ranking are the three booklets “l’italiano per stranieri” by Katerin Katerinov, known in the field as the “katerinov grigio, katerinov verde, katerinov marrone”, from the colour of the cover. 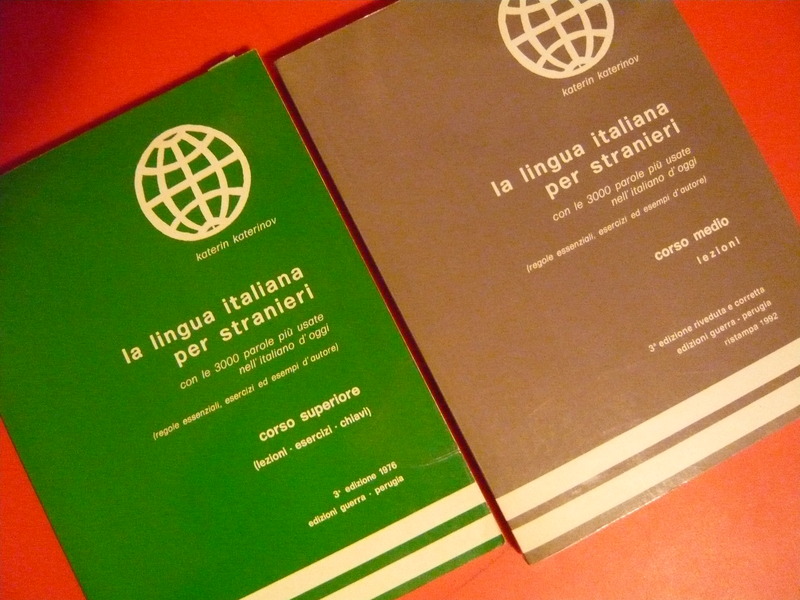 The “katerinov grigio” and “katerinov verde”, the grey and the green booklets, contain the whole of the Italian grammar for foreigners, the necessary blueprint to build your Italian language, nothing less and (very important) nothing more. They are concise but complete, with good charts and nice examples; a buy, if you want a grammar book, also for self-study. The “katerinov marrone”, the brown one, is an exercise-book, it is a good complement to the other two, but you need a teacher to work with it. If you want to see the world as a travelling teacher of Italian for foreigners, just pack these three booklets, and your creativity – it’s everything you need !